Surgical outcomes, impact of obstetrics on the pelvic floor, vaginal and robotic surgery for prolapse along with urinary incontinence treatments. Vaginal, robotic and abdominal surgery for prolapse and urinary incontinence, including women with recurrent prolapse and mesh-related complications. Office procedures for prolapse and urinary incontinence including pessaries and urethral injections. 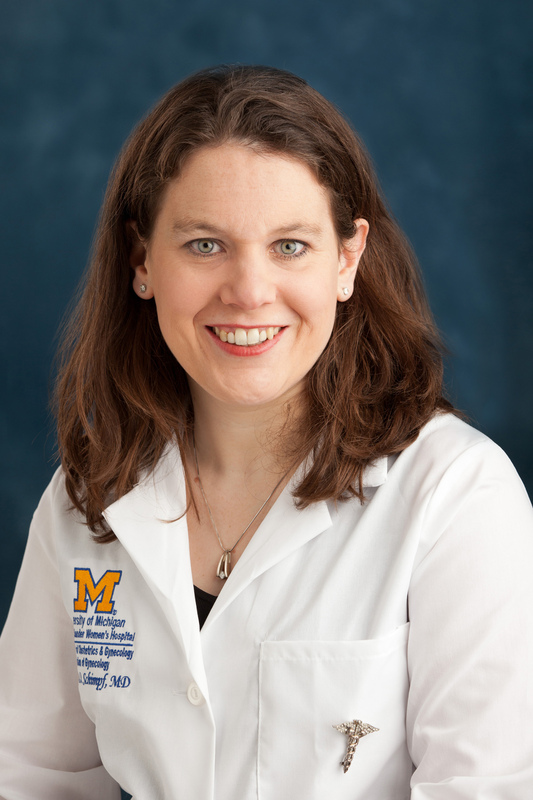 Dr. Megan Schimpf completed her undergraduate and medical education at the University of Michigan before going to the University of Connecticut for residency training. She completed her fellowship in female pelvic medicine and reconstructive surgery at Hartford Hospital before working on the faculty at the University of Pennsylvania at Pennsylvania Hospital. Dr. Schimpf has been board certified in obstetrics and gynecology since 2006. She came back to the University of Michigan to join the faculty in early 2012, and is very happy to be back in the great city of Ann Arbor again. Her clinical interests include surgical outcomes, impact of obstetrics on the pelvic floor, vaginal and robotic surgery for prolapse along with urinary incontinence treatments. Dr. Schimpf believes that no one should have to limit themselves due to pelvic floor disorders.